Nightforce's NXS 2.5-10x24 is one of the most versatile, practical all-a round riflescope configurations. Its compact size, low profile and streamlined design provide a wide range of mounting options on virtually any rifle. The superb resolution of Nightforce lenses results in low-light performance comparable to–and in many cases exceeding–lesser quality riflescopes with massive, bulky objectives. There are no parallax or focusing concerns, making it extremely quick in the field. 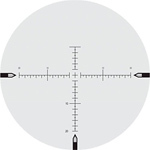 A wide magnification range allows the 2.5-10×24 to perform brilliantly from close-in situations to substantially long ranges. It is light in weight and will not overwhelm smaller rifles.